America Revealed: Has President Obama Made the Economy Better or Worse? Has President Obama Made the Economy Better or Worse? A persistent talking point used by Republicans is that rather than improving the economy, President Barack Obama’s policies have actually made it worse. House Speaker John Boehner, in what might be called a prebuttal, posted online his critique of the State of the Union address even before President Obama delivered it. Among the claims made by the Ohio Republican from West Chester; "President Obama's policies have not helped our economy; as a matter of fact, his policies have made our economy worse." He has repeated the charge since then, in interviews, news conferences and printed statements. Others, too, have made the claim, including Florida Sen. Marco Rubio in the Republican response to a Saturday message delivered by the president. PolitiFact Ohio took on the challenge of checking into Boehner’s sweeping statement. We’ll start by noting something PolitiFact has said in the past: That the economy is so complex and impacted by so many factors that it’s difficult to pin its successes or failures on the policies of one person. With that, though, we thought the speaker’s statement offered a good opportunity to take stock of how well the economy has actually performed. What we found, though, is that measuring the economy can involve many yardsticks, and the answer may greatly hinge on a person’s perspective. We asked Boehner's office how he supported his statement, and meantime went over the ground we covered before. Acknowledging that there is no perfect mix of economic statistics, and that a wealth of them are available, PolitiFact Ohio started with statistics in seven categories that economists told us would be good measures of the economy. Gross Domestic Product: There have been 12 quarters since Obama was inaugurated, including one that already had begun. During the first two, GDP shrank. (GDP also shrank during three of the previous four quarters, when George W. Bush was in office.) GDP has risen during the 10 quarters since then, though at relatively anemic rates of growth. Earnings and income: Personal income in 2011 was about 4.7 percent higher over the level it was in 2010, according to the Bureau of Economic Analysis. The 2010 annual level was 3.7 percent greater than the 2009 level, it said. Average hourly earnings for private workers are 5 percent higher than they were in January 2009. Industrial production: Industrial production has increased by more than 8 percent from Obama's inauguration, though today's level is still lower than it was in 2007. The stock market: The stock market is one step removed from basic economic indicators, but it does show what investors think about the prospects for the broader economy. Between Jan. 20, 2009, when Obama was inaugurated, and Jan. 30, 2012, the Dow Jones Industrial Average increased by 59 percent. The Dow Jones U.S. Total Stock Market Index -- a broader indicator of the domestic stock market -- rose by more than 69 percent over the same period. The housing market: Existing home sales increased for a third straight month in December 2011, remaining above levels from a year earlier. For all of 2011, sales totaled only 4.26 million homes -- up slightly from 4.19 million in 2010, but far below the 6 million that economists equate with healthy housing markets. In 2005, at the peak of the boom, 7.1 million homes were sold. The bust of that boom was a major factor depressing the economy. Available housing inventory has been declining since it set a record of 4.04 million units in July 2007, and is now at the lowest level since March 2005, when there were 2.30 million homes on the market. Personal bankruptcies: The level of personal bankruptcies was 6 percent higher in the third quarter of 2011 than it was in the first quarter of 2009. (The level a year earlier, in 2010, was 26 percent higher.) Business bankruptcies declined by about 22 percent over the same period. Jobs: The unemployment rate has risen from 7.8 percent in January 2009 to 8.5 percent in December 2011. In terms of trends, however, it is also accurate to say that the jobless rate dropped in December to a near three-year low of 8.5 percent. The difference in terms relates to the recession that began in December 2007, according to the National Bureau of Economic Research. The jobless rate began to climb in June 2008, reached its current level in February 2009 and hit its peak level of 9.9 percent in December 2009. The rate remained above 9 percent until October 2011. So is the economy better or worse? The seven factors above offer mixed results. PolitiFact national used those catagories In December 2010 when rating a claim by Matthew Dowd, a former strategist for President George W. Bush, who said on ABC's "This Week with Christiane Amanpour" that "Barack Obama is in an economy that's only worsened since he's been president of the United States." PolitiFact rated that statement Half True for its mixed bag of results. Boehner's statement, too, goes a step further. No only did he assert that the economy has worsened, but that the Obama administration is responsible for making it worse. Boehner's staff cited the persistence of high unemployment -- above 8 percent for 35 months -- as a major factor supporting that claim. They asserted that the economy has lost 600,000 jobs since Obama’s "stimulus" took effect, and added, "The Obama Administration promised its ‘stimulus’ would keep unemployment below 8 percent." The under-8 percent "promise" by Obama has long been a talking point for Republicans that PolitiFact has addressed several times and found it wanting. We found that on several occasions as the stimulus was being considered, President Obama warned that if "dramatic action" were not taken, the recession could linger for years, and "the unemployment rate could reach double digits." But we found no instance of anyone in the administration making a public pledge that the stimulus would keep unemployment below 8 percent. The claim has its roots in a pre-inauguration report called "The Job Impact of the American Recovery and Reinvestment Plan" from two of Obama's top economic advisers. It was a projection, not a promise -- one that came with heavy disclaimers, with warnings of a high margin for error, and was built on government data that turned out to have underestimated the severity of the economic contraction. The record on job loss and creation changes depending on when you start counting. When Boehner made his claim, there were 1.7 million fewer jobs in the country than when Obama took office, in January 2009, a figure from government data that is often cited in Republican criticism. That number dropped more when recent unemployment numbers were released. 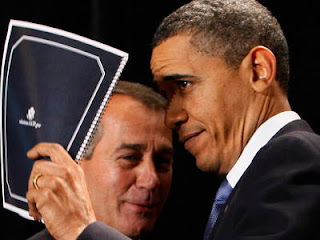 Boehner said that since the stimulus package took effect there are 600,000 fewer jobs. That’s, too, was an accurate count when he made his claim if you start counting from February 2009, according to the Bureau of Labor Statistics. It too declined in the jobs update. But Boehner’s statement also assumes that the American Recovery and Reinvestment Act, the so-called stimulus, "took effect" as soon as it was signed. And that raises another reason it’s difficult to precisely judge improvement in the economy. Improvement or decline can vary depending on when you start counting. In his State of the Union speech, Obama acknowledged that job losses didn’t stop when he took office, saying that it took some time for his administration’s policies to take affect. That time lag is why the picture can change. Data from the BLS backs the notion that the trend has been toward job growth. Job loss in January, February and March 2009 were great enough to cause a net job loss for the time Obama has been in office. But if you measure from after those first three months, Obama has presided over a net increase in jobs through December 2011. So by that gauge the economy is improved, right? To a person who lost their job in those first three months and remains unemployed, that might be a hard sell. That’s Boehner’s point about persistent high unemployment. Boehner's claim implies the Recovery Act did not help job creation. Mark Zandi, the chief economist of Moody's Analytics, would disagree. He has credited the stimulus legislation with putting the brakes on the job losses. After Boehner told the City Club of Cleveland in 2010 that "all this stimulus spending has gotten us nowhere," Zandi said just the opposite was the case. "We would be in a measurably worse place if not for the stimulus," said Zandi, who was an advisor to John McCain's presidential campaign. The national unemployment rate at the time was about 9.5 percent. Without the stimulus, Zandi said, it would have been 11.5 percent. He said expectations for the stimulus may have been too high, "but the stimulus did exactly what it was intended to do. It was to end the recession and jump start a recovery and it did that." There’s that lag time again. Boehner’s office also cited the price rise in gasoline since Obama took office and increases in food stamp use and the national debt. He’s right that for all three of those negative factors the numbers have gone up, although they weren’t among the principle indicators economists cited to PolitiFact of how the economy performed. What all of these point to is that the economy is such a broad topic with so many ways to gauge it’s progress that it’s difficult to nail down one clear picture. Unemployment continues to trend downward and the number of jobs continues to grow, but there still are fewer jobs than when the president took office. Industrial production has grown and the stock market is doing well. But housing sales for 2011 remained significantly lower than what economists equate with a healthy housing market. So there clearly are signs of improvement out there some areas with clear trends to the good. But, there also are rough spots that show the economy isn’t in the clear yet. How strong or weak economic recovery has progressed may all boil down to whether one views the glass as half empty or half full.